It was clear to me, from this “Why Choose Us” page and from reading through the home page, that the writer of the website was focused on applying logic in convincing visitors to become patients. If this dentist decides to let us help him, we will re-do this entire approach. A mistake many dental marketers and dentists make is thinking that the choice of a dentist is all about logic. It’s not. It’s not even primarily about logic. Whether the prospective patient likes you or not is an emotional thing. If your website doesn’t address the emotions behind choosing a dentist, it will never be as successful as it could be. Logic is certainly involved, but emotion is what creates the first impression and is the stronger motivating force in conversion. In the website of this prospective client, in their attempt to be logical, they make some serious emotional errors. For one, they are braggadocious. Bragging undermines trust. Second, they act eager for people to make an appointment, which also undermines trust and makes the dentist look needy—not a feeling you want to promote either. If you look at the advertising for highly successful brands, almost all of it focuses on creating certain emotions surrounding the brand. Emotion sells. If that’s true for selling cars and fast food restaurants it’s that much more true for selling dentists. People feel very vulnerable in the hands of dentists. They have little clue as to what is going on in their mouths and are looking for trust and caring, sensitivity, and a listening ear. 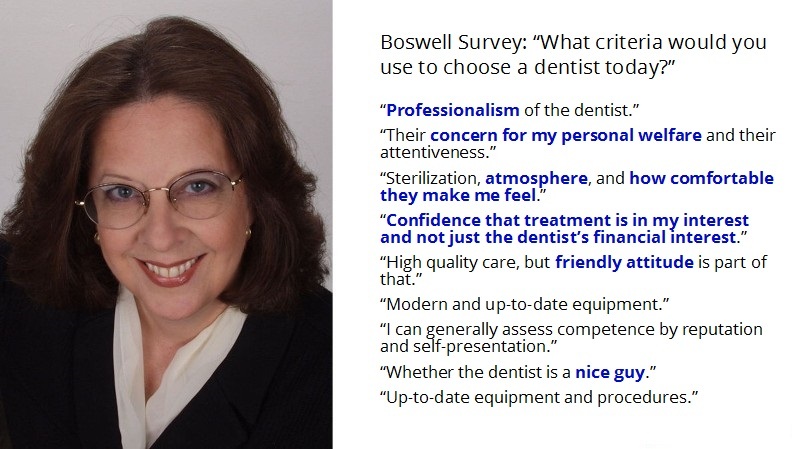 One of my favorite practice management and dental marketing consultants is Suzanne Boswell. The reason I like her is that she bases her lectures and advice on actual data gathered from surveys and focus groups rather than on intuition and anecdotes. Back in the 1990s she did a number of focus groups asking people what criteria they would use in selecting a dentist. Here is an image from a slide presentation listing those key criteria. I’ve highlighted those reasons that are based on feelings. Look at the first reason she lists and think about the feeling that it creates if you brag on your website. Does that convey a sense of professionalism? I don’t think so. True professionals are more humble. Look at the second and fourth reasons. This is a question in the back of the mind of almost every prospective patient: Are you going to care about me and be honest with me, or do you care more about the money? When you appear eager for the patient to make an appointment, people take that as a signal that you care more about the money. We have research data that tends to indicate that this is a powerful turn-off for website visitors. For some marketers, bragging and being eager for the sale are in their blood. But this approach is counter-productive in marketing dentistry. The proper tone for a dental website is a professional tone that lets the reader know that the dentist is more interested in the patient than the appointment. It is more matter-of-fact, providing good information. A tone like this helps create positive feelings of trust. This “Why Choose Us” page is born of a desire to convince the patient to make an appointment. Too much interest in the appointment sends the wrong signal to the prospective patient. When a dentist has strong credentials such as accreditation, extensive continuing education, awards, or other achievements, we don’t want to hide those, but we do want to present them with a tone of humility. This is done by presenting the achievements as facts without any embellishments, as if you’re a reporter, not a salesperson. And I don’t want to suggest that we want the tone of the website to be aloof. While conveying that it’s not a big deal to you whether the patient schedules with you or someone else, you still want to show that you do care and are warm and friendly—you’re interested in the patient. Invite them to make an appointment—just don’t overdo it. In a previous blog post, I talked about selling trust. That is the key emotion you want to convey on your website. The corollary to selling trust is showing that you are professional, humble, and caring. Hopefully you really are.